I have been back from the Readers Studio 2011 for a week and I’m still absorbing all the wonderful things I learned and the experiences I’ve had hanging out with the Tarot Tribe. From that journey into the lands of Tarot delights and visions, I have resolved to focus my attention and be active in my Tarot journey. Towards that focus, I’m combining my Dark Moon Tarot blog with my Rowdy Goddess blog. After all, isn’t Tarot the essence of rowdiness? One of the speakers, Caitlin Matthews, talked about Tarot readers, energy workers and others in the fields of esoterica as inhabiting the fringes and edges of society. It’s at these borders where the the boundaries are pushed, questions are asked, and critique occurs. It is where we go when we feel like an outlander in our own homes or mainstream society. It is into these borderlands that the Fool travels, seeking whatever it is he is seeking, far away from the domesticated lands of civilization. 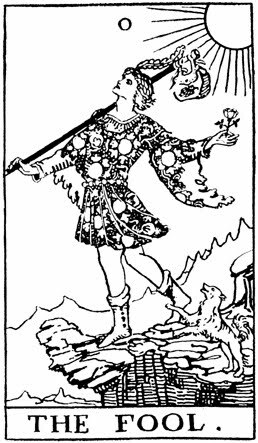 It is often said that the Fool is seeking a fresh perspective, or is he looking for a wild world where questions are asked and the standard answers no longer apply? He finds that the questions are alive and evolving in that wilderness. This is where civilization has unraveled to reveal a more raggedy edge. It is an opportunity to look at life with fresh eyes and decide if reweaving is what is sought or if something else needs to happen. Barbara Moore taught us to look at each card with a fresh eye, to see the questions in the cards and then to see the patterning of questions as tarot spreads; spreads that will help us understand patterns. As the images and the questions dance together, a pattern emerges as a spread. Barbara also encouraged us to place the cards asymmetrically, to offset some cards and to place the cards at angles to each other. The very act of asymmetry compels us to view patterns through different lenses. Sometimes our lives become so circumscribed or hemmed in by our answers, we don’t see there are new ways to pose the questions, or even that there are other questions to be asked. Sometimes new questions emerge as we place things in different relationships to one another. The same is true for readers, spreads, questions, and querents. As a Tarot reader, librarian and spiritual seeker, I have learned that living the question is the prize. Just as the power of the journey is in the journey itself (thank you to Ursula K. LeGuin’s masterpiece The Left Hand of Darkness) so is the question itself the journey. As I look at the Rider-Waite-Smith image, my attention is attracted to the pack. What is in there and what needs to be unpacked? Is it too heavy? Then I turn my attention to the pole. Is it strong enough? Does it hurt the Fool? Does it help or hinder? And of course the dog. I always notice dogs! Is the dog herding him, following him or is the dog a boon companion? Then the cliff and then the rose bring more questions. Five images turn into five positions in the spread. Five is a good number for a reading because it shows the chaos of change and of questioning the status quo. Fives don’t often provide “the final answer” but can provide some additional guidance or, at the very least, more information. The spread is simple, deceptively so, since the questions beget more questions. The cards can provide more insight. Some of my students like guides for when to use certain spreads. This one is good for people seeking more information at the start of a new journey, project, or if they are thinking they need a change. And it’s good for people in the midst of chaos to help them find a focus. What do I have packed for my journey? What enables me to carry my burdens/gifts? What threshold am I approaching? What aids me or is nipping at my heels? What beauty is unfolding for me? This thread is brand new and I have read much with it. I’d be very interested in your feedback and experiences. May your journey to the outer edges be filled with questions, magic, beauty and delight!